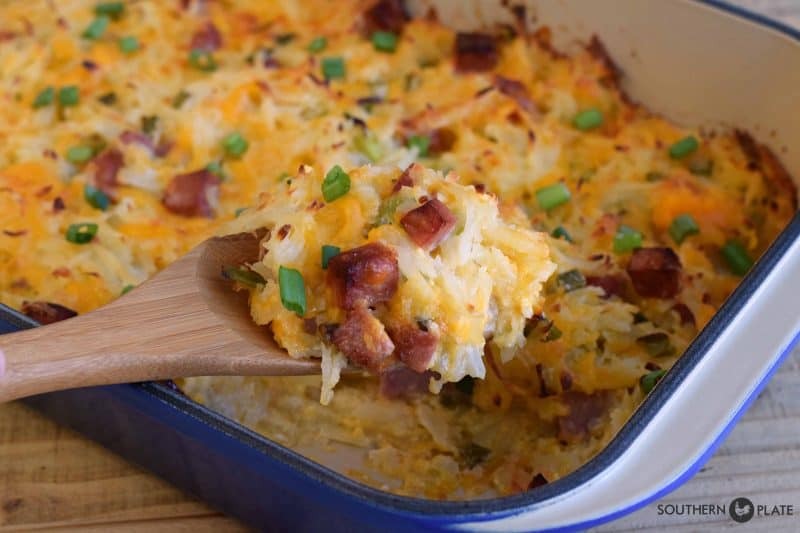 Deluxe Cheesy Hash Brown Casserole – Thanksgiving Leftover Makeover! Today, many of us are blessed with an abundance of leftovers from Thanksgiving in our refrigerators – and since many families would rather not have a third or fourth Thanksgiving meal, this calls for some creativity. I’m going to show you how to remix some of those delicious leftovers into a deluxe hash brown casserole that is fit for a meal all by itself if need be! 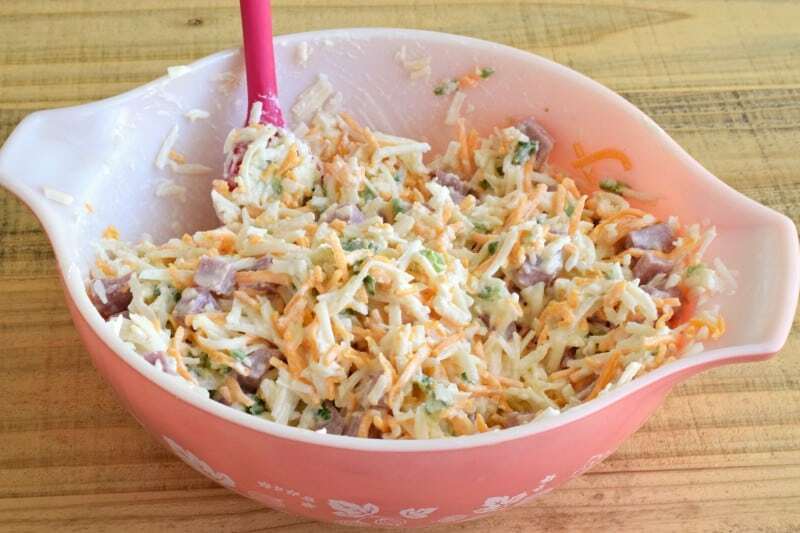 You’ll need: Frozen Hash Browns (the shredded kind), Milk, Sour Cream, Cubed Ham, Butter, Salt, Pepper, Garlic Powder, green onions, and Borden Mild (or sharp) Cheddar Cheese. Note: We have double meat at Thanksgiving: Ham and Turkey. If you only have turkey, that would also be great in this dish. Feel free to use yellow or white onions as a substitute for the green also. 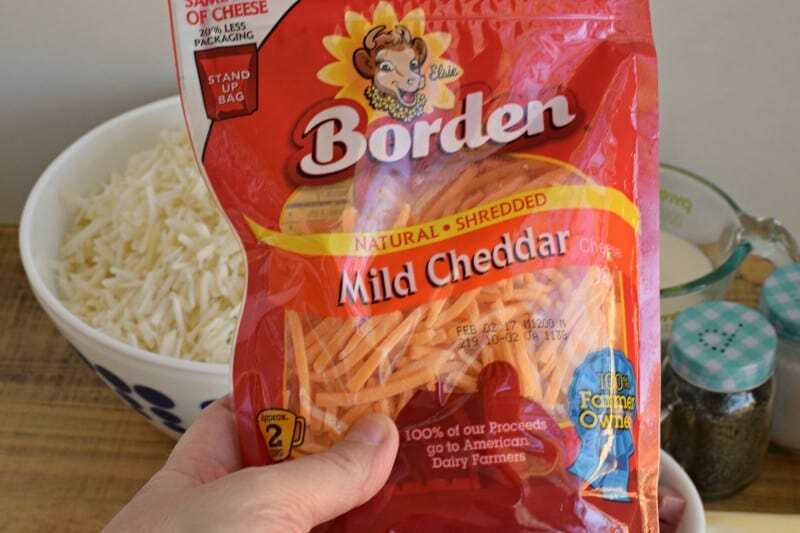 Borden Cheese offers: Mild Cheddar, Mozzarella, Mexican, Swiss, Sharp Cheddar, American, Colby Jack and more, which are available as singles, shreds, chunks, slices, strings and snacks. It is available at major grocers and retailers around the country and supports over 8000 family owned dairy farms across the United States! Assembling is as easy as just about any other hash brown casserole: Dump ingredients in a bowl and stir until well combined! 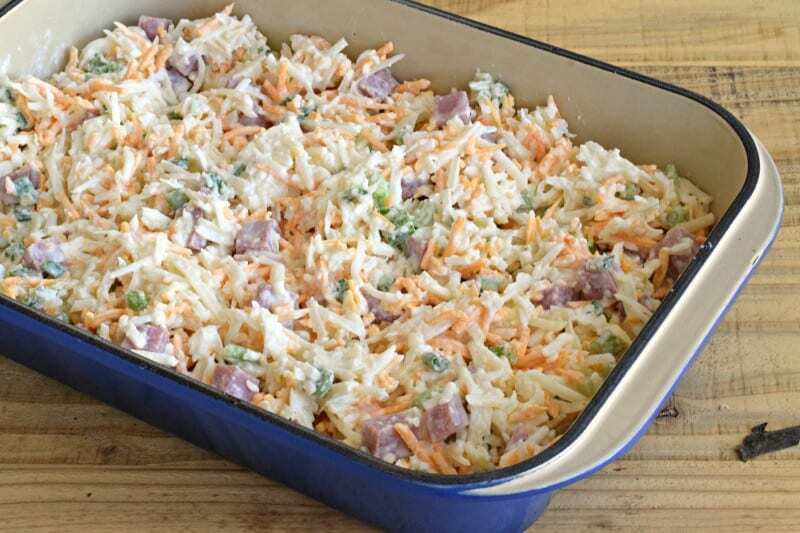 Spread this into a greased 9×13 baking dish and bake at 350 for about 30-40 minutes. Serve hot and enjoy the cheesy comfort of this deluxe version of a classic! I hope you and your family had a wonderful Thanksgiving and I wish you blessings, joy, and many wonderful meals together as we begin the Christmas season! Deluxe Cheesy Hash Brown Casserole - Thanksgiving Leftover Makeover! Combine all ingredients in a large bowl and stir until well combined. Spread into greased 9x13 dish. Bake, uncovered, at 350 for 30-40 minutes, until lightly browned. 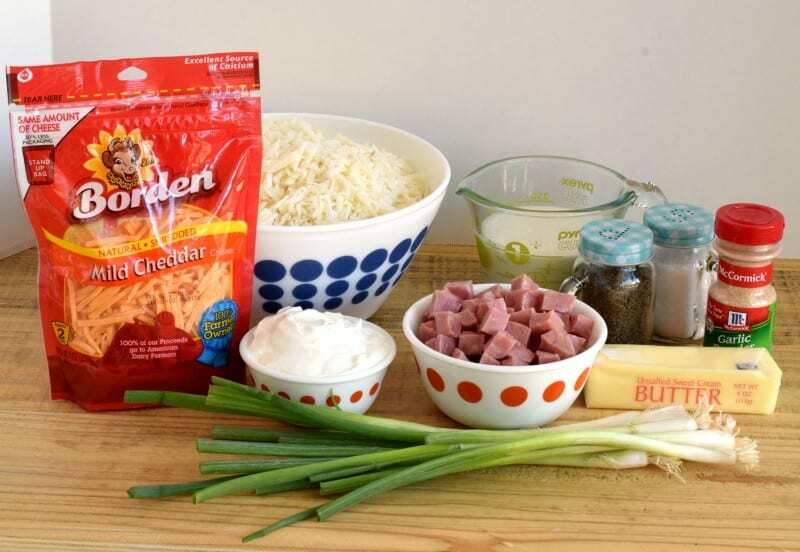 You can learn more about Borden Cheese and get some fabulous recipes at their website by clicking here. 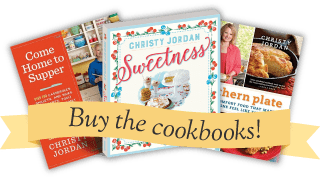 Special thanks to Borden Cheese for graciously sponsoring this post and helping me to bring my recipes to you. I appreciate their support of Southern Plate! For more information about our products and where to purchase Borden® Cheese, visit com, Facebook.com/BordenCheeseUSA or Instagram.com/borden_cheese. my word that looks good. I love the Borden products but never knew that about the farmers. TY for the info. Thank you Barbara, hope you get a chance to give it a try soon!!! Can I use your homemade cream of mushroom soup recipe to make soup for meal? If so how would i about doing that? Make it then dilute with milk or? So you’re asking about serving cream of mushroom soup as a soup, not using it in a dish, right? You can absolutely use the homemade recipe but there is no need to dilute that one since it’s freshly made and not condensed. Good to see ya, Vera! Yes that’s what I’m asking. To make it as a soup for meal. We like cream of mushroom soup with rolls as a meal. I have a recipe I’ve used but it’s so involved and takes a very long time! So was looking for a easier recipe and remembered yours and wonered of it could be served as a meal? Idk if you remember me but I meet you a couple years ago at a book sigining in Columbia,SC. I had my mom and twin daughters with me and you gave them pretty bead necklaces. I would love to connect with you sometime and talk. I always love to visit with people! I don’t venture outside of my house very much (I’m a terribly recluse) so most of my communication takes place via email and comments here as time allows (email can be a bit overwhelming). Finishing up my book tour this week and next and then plan on dropping off the map a bit for Christmas but I have every intention of turning into a human again come January! Would like to get your mailing address if you don’t mind emailing it to me! MY GRANDBABY IS ALLERGIC TO MILK PROTEIN 🙁 DO YOU THINK THIS WOULD WORK WITH COCONUT MILK? HOW DO you think this would turn out using boxed hash browns? They appeared in my cupboard and need to use them up. Thank you!